This is a Guest Post By Ben Brown. A happy and healthy pet benefits from a good diet and plenty of exercise. When it comes to choosing the right dog food, for example, it’s always useful to read about other people’s experiences, particularly if they have the same size or breed of dog. Having followed dog food reviews for quite a while now, it’s clear that whilst some are merely marketing exercises designed to promote a specific brand, and therefore not really useful as a guide, others are from independent sources, genuinely objective and eminently more helpful. In the main, the most believable reviews are written by dog owners who have tested a variety of different food types, and the more reviews a brand receives helps to improve the accuracy of what is reported. 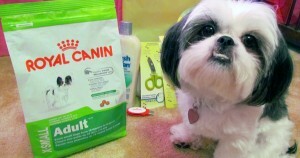 It’s evident that there are certain key elements to look out for when choosing dog food. Always read the label before buying and look for the best ingredients – a quality dog food will have meat or fish at the top of the list, indicating that this is a major constituent. A balanced diet for a dog will have the right mix of minerals and vitamins, proteins, fats and carbohydrates. There are also ingredients to avoid – those that are inferior and add nothing of quality. A good source of protein is the most important part of any dog food. The first form of fat listed on a dog food label can be either animal or vegetable and will be a major part of the contents. Much smaller amounts of ingredients providing minerals, vitamins and probiotics will normally be listed after that. Fats and oils are needed for a glossy coat and good development of the brain. Evaluating the quality of listed ingredients is tricky, as many manufacturers give no indication of where or how these are sourced. In the main, it is safer to stick with reputable, trusted brand names and to be wary of exceptionally cheap food from an unknown manufacturer. If a dog food gets great results, this will soon become widely known and the brand’s popularity will undoubtedly increase. Reading about different types of dog food, and the results reported by dog owners is helpful, as is getting answers to questions directly from the manufacturers, for example about the calorific content of a food, which may not be listed on a product label. Trying out different types of food makes sense as dogs will have preferences depending on their size, breed and what tastes good to them. Carbohydrates are essential for energy, for example, however whilst some dogs will tolerate a diet with plenty of carbs from grain sources, others will prefer a grain-free diet. There are a few things that might be found on a list of ingredients that should start alarm bells ringing for any conscientious dog owner. Additives such as Glyceryl Monostearate, Propylene Glycol and Phosphoric Acid should be avoided if at all possible – these chemicals are unnecessary additions. The same can be said of binders such as wheat or corn gluten. Finally, check sources listed for carbohydrates, fiber and fat, and also flavorings and coloring agents and choose products containing only those that can be trusted. Dog foods should be as natural and organic possible because it is more healthy compared to synthetic based dog foods. “:,*.